"Dear Gizmodo," the email started, "I would like to introduce our new product." I could have never imagined that such a neutral phrase was hiding the best phone stand ever created by mankind, one that can store your headphones and act as a keyring and make your phone look like a duck face. 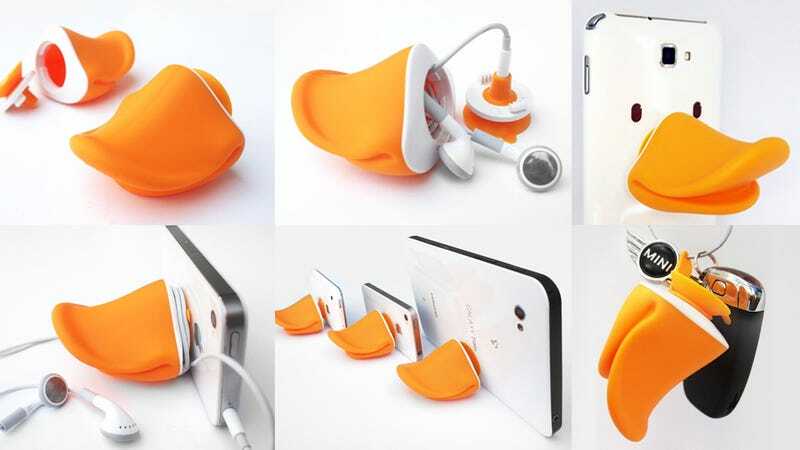 Yes, that's right—THIS PHONE STAND IS ACTUALLY A RUBBER DUCK'S BEAK. The cutest, most perfecterest rubber duck beak any human can possibly imagine. I want to kiss it. Everyone should have one. The name of this $20 sucking cup thingamajig is the iDuck. But. Of. Course. And it's the creation of a Korean design company that responds to the magical name of Knock of Neverland— which shall become the name of all my future children. The duck beak shape is very familiar with us. There are many kinds of duck beak products in the world. But only iDuck can transform your mobile phone into a duck face (You can use the eye stickers in the package). We think mobile phone is the most often used device and a necessary gadget to us these days. We want to give them not only convenient functions but also witty accents. EXTRA BONUS: You can turn your black phone into Daffy Duck. If this product doesn't go viral, I'd lose my faith in humanity.